Welcome back to the Spring term. We hope you had a wonderful Christmas and New Year! Thank you very much for your very kind and generous gifts. Just a reminder that PE will take place on Mondays so please make sure your children have their PE kits in with the correct clothing. For outdoor PE, children need to have a green sweatshirt, white t-shirt, plain black jogging bottoms, trainers and socks. For indoor PE, children will need a white t-shirt, plain black shorts and plimsolls. Just to remind you that earrings are not to be worn on PE days. We are looking forward to the learning adventures that this term will bring! 'A Christmas Recipe' - Please check your child's book bag for a note about the costume they will need for our Nativity play: 'A Christmas Recipe'. Please make every effort to have the costume at school by Friday, 30th November 2018. Please ensure that it is clearly labelled with your child's name. Big Sing/ Little Sing Concert Wednesday 12th December - just a reminder to send the reply slip back into school asap. The children have loved learning all of the songs for the concert and they sound so good! They have learnt all of the actions and we are looking forward to seeing them and hearing them on stage joining in with children from other schools in Witham. Please could you make every effort to bring your child to the concert to sing. This will be an amazing experience! All of the details are in the letter we sent home last week. Parent Teacher Consultations - Tuesday, 30th October. 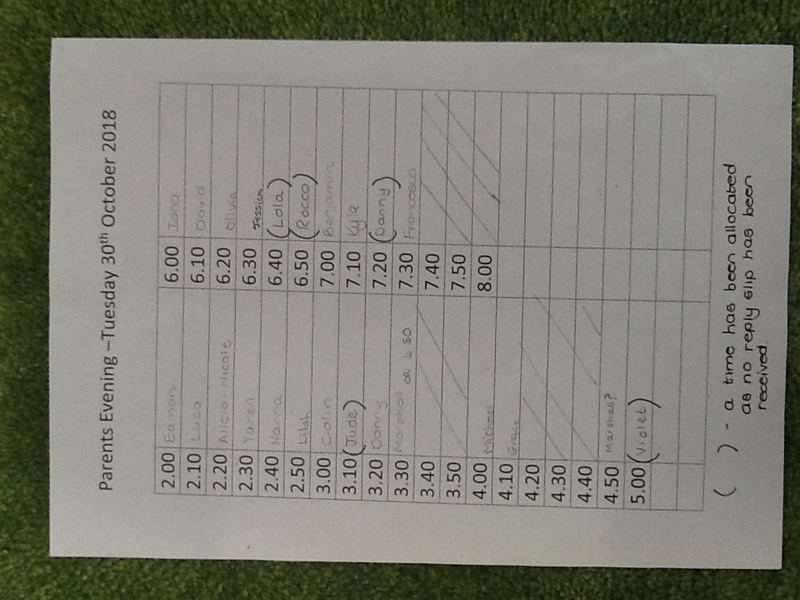 Your child should have brought home a confirmation slip with their appointment time. If the reply slip was not returned to us, an appointment has been allocated to you. Please check the attached 'timetable' to check your time if you are unsure or if your child was away from school on Thursday. PE kits - PE kits were sent home on Thursday. Please use the half term break to check your child's PE bag and ensure that they have everything that they need. Please return PE kits to school on Monday, 29th October (first day back at school after half term). Our topic in RE is Belonging and we have been looking at Baptism. If your child has been baptised and they have one of the following; a candle, a blanket, an item of clothing or photo of their baptism, could they please bring them in to show the class on Tuesday, 30th October. A huge thank you for the gifts of stationery we have received so far! There was great excitement from me and the children as we unpacked the carrier bags and displayed the gifts. We really appreciate your generosity! Please have a look in your child's book bag tonight (Friday) for a letter regarding flu vaccinations as well as a page to insert into the Homework Helper. My sincere apologies for the mistake that crept in. Please replace the page with the mistake with the page sent home tonight. 21/11 - The Class Mass on the diary dates is subject to change ... more soon! Meet the Teacher - It was so lovely to see some of you at the meeting. Below is the powerpoint (as promised) for those who could not attend. A very warm welcome back to school and to Year 1. We hope that you have had a super summer holiday and are ready for an exciting and busy Autumn Term. Black tracksuit bottoms and a green tracksuit top. (These can be sent in to school once the weather begins to turn colder). Our PE days are Monday and Wednesday, but your child’s PE kit should be at school every day.